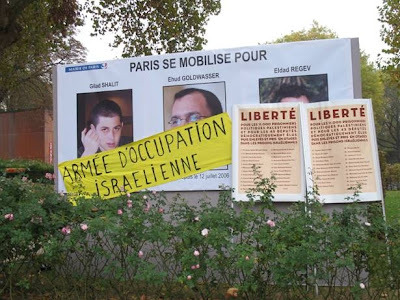 Itzhak Rabin Parc (Paris 12ème), 19 October. 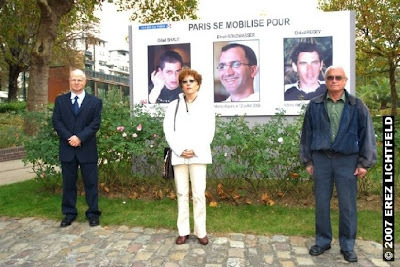 The parents of the three soldiers (Gilad Shalit (abducted by Hamas on 25 June 2006), Ehud Goldwasser and Eldad Regev (abducted by Hezbollah on 12 July 2006)) in front of their sons' portraits. This shameful act of vandalism was carried out, and filmed, on 27 October, by 4 pro-Palestinian 'militants' who made a speech and shouted the usual slogans: "Israeli army, criminal army! Free the prisoners! No no no to occupation! Stop the slaughter of Palestinians!"